So, you’ve been invited to someone else’s house for Thanksgiving Day dinner. This means you won’t have to fuss over a bird, clean every nook and cranny of your house, or obsess over whether to finish that DIY bathroom remodel before your guests arrive. But you would like to bring some nice wine, which begs the question: What makes for a good Thanksgiving wine? The challenge with selecting wine for a traditional Thanksgiving meal is that the main dish and accompanying gravy and stuffing are savory, while the rest of the meal is either mildly seasoned and buttery (mashed potatoes, rolls) or slightly-to-overly sweet (carrots, corn, sweet potatoes, zucchini bread, mystery-colored gelatin). Add tart cranberry sauce and cheesy broccoli casserole, and you’ve got a wine and food pairing puzzle that would confound most sommeliers. Relax. It’s relatively easy to find wines that pair well with this meal, especially with turkey. The trick is to choose wines that are dry (as in, not sweet) and balanced that will complement, not overpower, each dish. For reds, you’ll want to look for varietals such as Gamay, Syrah, and Grenache. With whites, go for wines made with Gewürtztraminer, Riesling, Grüner Veltliner, and Chenin Blanc. To appeal to all tastes, it’s best to bring one bottle of white and one bottle of red to dinner. Here are some of my favorites—most bottles are under $20—including a rose for in-betweeners. Rieslings can range from sticky sweet to bone dry. The 2016 Mönchhof is a dry Riesling from Mosel Germany, a region known for its Riesling production. It has a hint of sweetness that is balanced beautifully with bright acid—exactly what you want in a T-day wine. Light and lower in alcohol (9.5 percent ABV), the Mönchhof should please everyone at the table, from I-really-shouldn’t-have-another-glass Aunt Cathy to your foodie cousin Mike. Most of the world’s gewürztraminer is planted in the Alsace region of France and throughout Germany. This one’s from Monterey County, California, where the Fogarty family’s been producing this unique grape since the 1980s. The near-absence of sugar in the 2015 vintage is a great match for roast turkey and pretty much everything else at dinner. This delicious white features notes of bright, ripe pineapple and candied ginger. It has a viscosity (wine speak for slippery) that your palate will find welcome if, let’s say, the turkey comes out a bit dry. The Champalou is imported by Kermit Lynch, a name that has steered me toward many good wines over the years. Made with Chenin Blanc grapes from Loire Valley, it leans heavily toward this varietal’s drier side. Super pale in color, the Champalou features subtle, citrusy notes and a hint of sweetness. It packs a punch in the nice, oily finish, and truly shines when paired with roast poultry—especially the juicy, crispy, coveted turkey leg. If you aren’t already smitten with rosé wines, it’s time to start experimenting. And no, you won’t lose your man card if you bring a bottle of rosé to dinner. This one’s from Tavel, France, a region that produces only rosé. 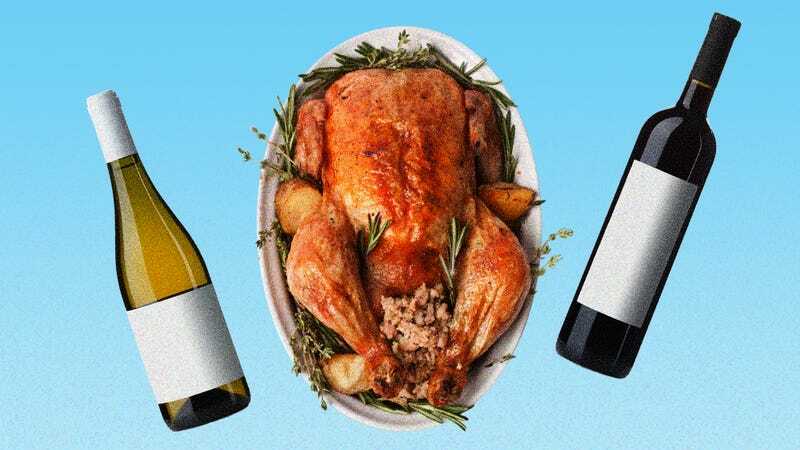 A blend consisting mostly of Grenache, Syrah, and Cinsault, the Roc-Epine has good structure and a hint of spice that will cut through gravy-laden dark cuts of turkey and stuffing. It also has a long, silky finish that will stand up to just about any dish at the table. The 2015 Fiction, a red blend from one of Field Recordings’ multi-vineyard labels, drinks as well as red blends priced $25 and higher. Nearly half of this well-balanced wine is Zinfandel, which gives it its spicy, peppery flavors. Additions of Syrah, Mourvedre, and Cabernet Sauvignon add notes of red and black fruits. The result? A smooth, balanced, jammy red. One of my go-to wines for any occasion, Fiction will pair especially well with savory dishes at the Thanksgiving table such as turkey, stuffing, and gravy, particularly if seasoned with sage, thyme, or rosemary. The subtle, smoky nature of a California pinot noir is a perfect foil for the Thanksgiving meal. This one is from Sonoma Coast and retails for about $24, an affordable price point for such an elegant pinot noir. The bright acids and soft finish make the 2016 vintage a perfect complement for roast turkey and all the trimmings.